Greetings friends and fellow crafters, LeeAnn here with three projects I have made using new stamp sets from Peek A Boo Designs. I have to say I love this release and it was really hard figuring out what to use for my first post. 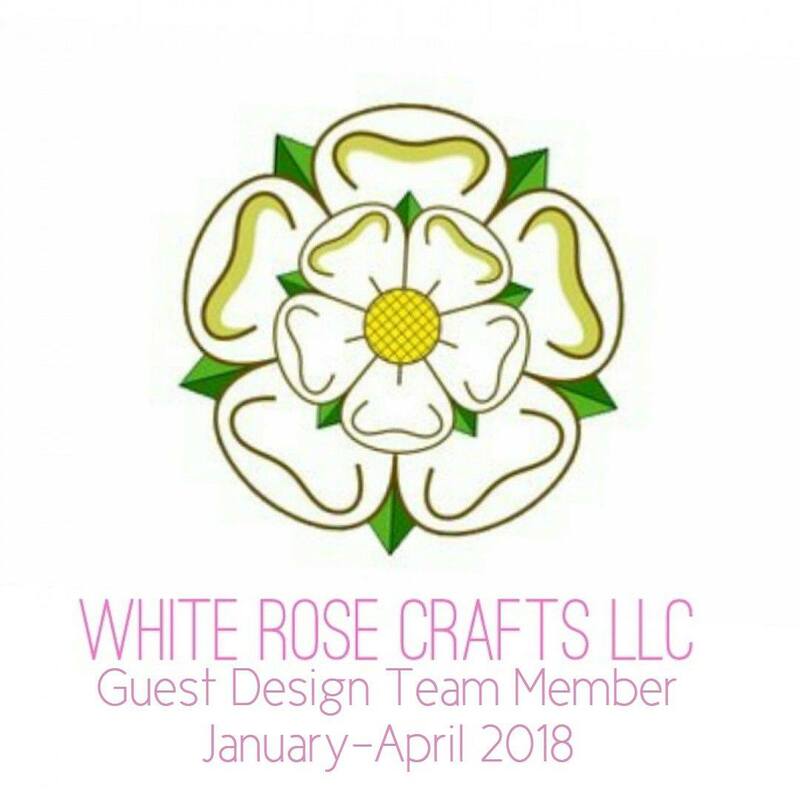 For this first project, I used Distress Oxides in Picked Raspberry, Fossilized Amber, Cracked Pistachio and Broken China and smooched them on my craft mat. I then spritzed with water and ran my watercolor card-stock through the inky fun. I set the page aside to dry. 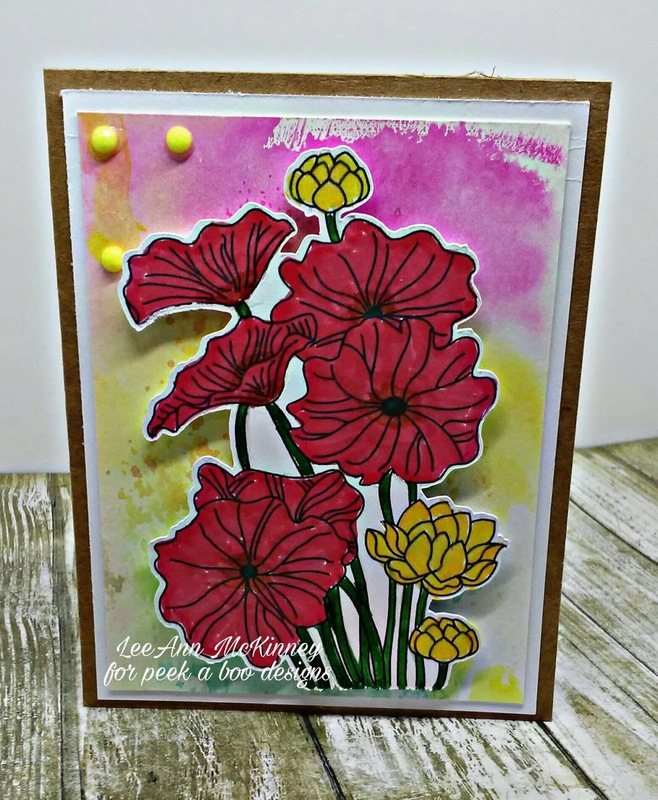 I then used Memento Markers in Ladybug, Cantaloupe and Dandelion to color my flowers. The stems are colored using Cottage Ivy Dew Drop and a Fantastix. I cut the watercolor panel to 3.75" x 5", mounted that on a white panel cut 4" x 5.25" and mounted those on a Kraft a2 card base using Tear tape. 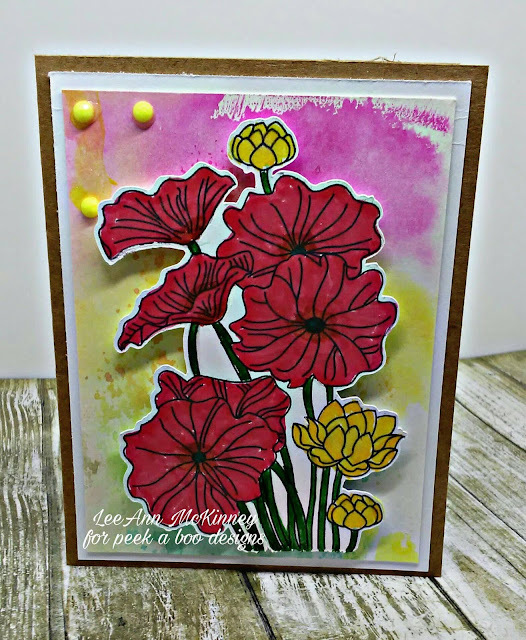 The flower stamp was cut using my Scan N Cut and mounted with foam tape for added dimension. My next project also began with Distress Oxides, in the colors Cracked Pistachio and Broken China. Using the same technique as above I smooched the inks on my craft mat, spritzed with water and ran the card-stock through. I wanted it to appear as the green was land and the blue the sky. 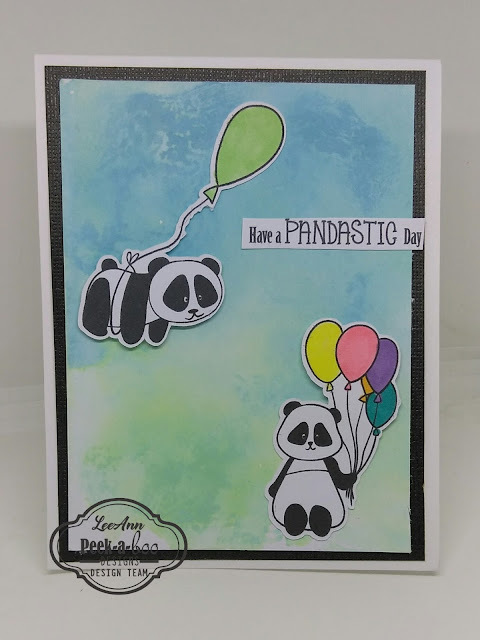 The little panda's with Balloons were cut using my Scan N Cut. The balloons were colored using Spectrum Noir Alcohol Markers from left to right the colors used were LG4, LY1/CT1, FS8, OR1, LV2 and BT6. The top panda is attached with foam adhesive and Tear Tape on the balloon, while the lower panda is attached with Tear Tape and the balloons with foam adhesive. This one for last as I had so much fun trying to decide what to do and it was honestly the easiest. The fish are cut with my Scan n Cut, Using the "Rule of Three" I chose to use 3 fish, each colored with the same Memento Tangelo color, just each one colored differently. One is completely colored, one is white with Tangelo highlights while the other is Tangelo with white highlights. The sentiment "Best Wishes" I thought went with this perfectly. 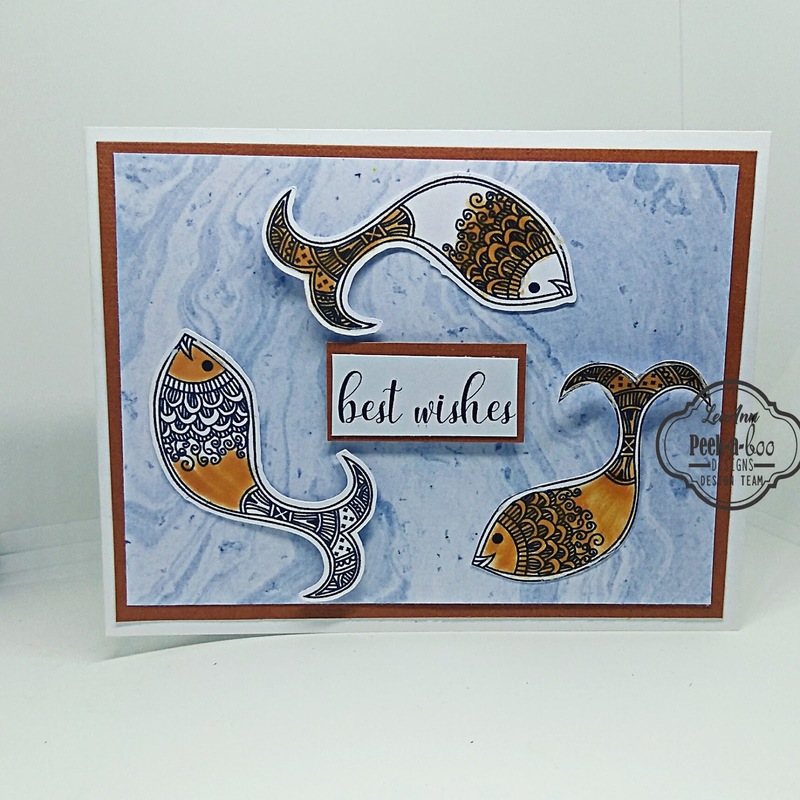 The base is an a2 in white cardstock, with a layer of burnt orange to pull out the Tangelo color cut 4" x 5.25", and the blue marbled is from a Ms. Sparkle & Co. from Joann's paper pack. The bodies of the fish is attached using Tear Tape while the tails are curled up. The sentiment is attached using foam adhesive. Beautiful cards! Thank you for sharing your talent with all of us.